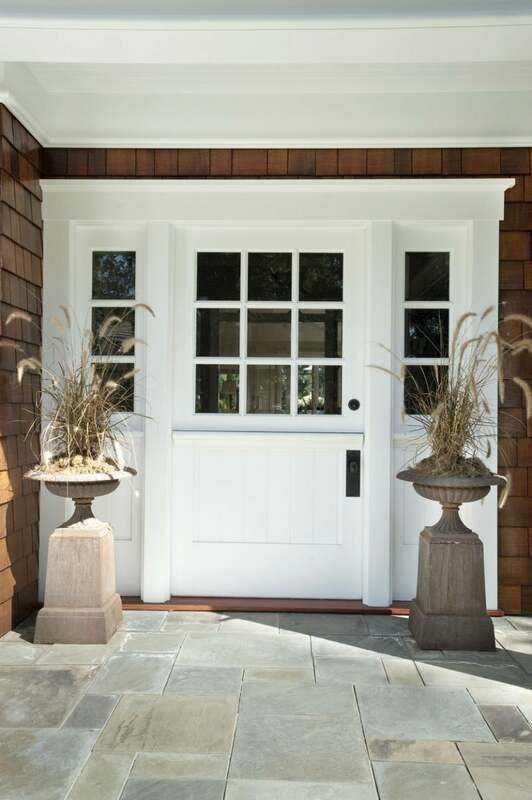 Old-fashioned farm-style Dutch doors are making a comeback for interiors and exteriors. Find out the cost, installation, and placement details of these country classics. Dutch doors—horizontally double-opening charmers—evoke endearing visions of quaint country cottages, thatched roofs, and freshly baked pies cooling in a summer breeze. While the design is nearly 400 years old, its appeal is timeless, so if you’re considering Dutch doors for your home, follow along to learn a bit about them, where they work best, and what installation entails. Exterior Dutch doors first appeared in Holland in the 17th century, and at that time, their purpose was purely functional. Built with a bottom half and a top half that opened separately, the bottom was often kept closed to prevent rodents and farm animals from wandering into the house, while the top was opened to let in light and fresh air. The lower door featured a small shelf along its top to help stabilize the structure of the door while offering a spot for baked goods to cool. Dutch immigrants brought the door design to America, and it quickly came into favor with early colonists and rural dwellers. It remained common until the late 1800s when the screen door was invented, yet as the exterior Dutch door trend waned, interior versions were just getting started, often appearing to separate kitchens and dining rooms. You can still buy Dutch doors today, both interior and exterior, although options are limited. The current trend toward farm style makeovers has brought Dutch doors back to the forefront of design. You’ll now see them at house entries, on outdoor buildings such as gardening sheds, and inside homes as well. Adorable as they are, Dutch doors also have some functional considerations. + Dutch doors create a strong country look and feel, serving as focal points in farm style kitchens and adding finishing touches to rustic cottage entries. + If you have toddlers or pets, keeping the bottom door closed will ensure little loved ones stay safely inside while you enjoy the outside world. + Similarly, an interior Dutch door can double as a baby-gate, keeping crawling infants safely in their nurseries—or out of home offices and laundry rooms. – If you live in an area with lots of insects, an open door to nature is an invitation to a buggy house. Installing a retractable screen (discussed below) can help. – Dutch doors are more expensive than standard doors because they require more hardware, such as hinges, knobs and locks, and (on exterior models) a weather-tight seal is necessary between the two halves. Expect to pay an additional $300 to $500 for a premade Dutch door as compared to a solid door of similar quality from the same manufacturer. Custom-made Dutch doors from major manufacturers are even pricier (upwards of $3,000), because they’re designed and built to fit a specific opening. – For the best weather tight results, exterior Dutch doors should be professionally installed. While the doors come pre-hung in jambs, during installation, the door frame may require shimming (straightening) and it’s essential to get both halves aligned perfectly to seal out the elements. Professional installation can add $300 to $450, or more. – Watch those fingers! They can inadvertently get pinched between the top and bottom doors when closing. While some of today’s top door manufacturers, such as Andersen, Pella, and Marvin, do not sell premade Dutch doors to the public, they offer custom door-manufacturing services, so you can often have a Dutch door designed to your specifications. One popular manufacturer, Jeld-Wen, currently sells Dutch doors through home improvement centers like Home Depot. When buying an exterior Dutch door, you can opt for two solid halves that match or select a unit with glass panes in the upper door to allow light in while the door is closed. It’s a good idea to install a pull-down retractable screen on the inside of the door frame, such as this Secret Screen Retractable Screen Door (available from Amazon). When the upper door is open, you can employ the screen to meet the shelf on the bottom half of the door to keep out pests and debris. Some manufacturers may offer doors with attached retractable screens. An interior Dutch door can be a delightful addition to a home, but you may have to do a little sleuthing to find the perfect one. Not all home improvement centers sell them, so consider checking with smaller, boutique-type door builders, such as the Simpson Door Company. Unlike installing an exterior Dutch door, which must be weather tight, putting in an interior Dutch door is a fairly DIY-friendly project. If you can hang standard interior doors, you can hang an interior Dutch door. If you can’t find the Dutch door of your dreams, consider making your own! With basic carpentry skills, you can turn a regular interior door into a Dutch door using a relatively simple process. It involves cutting the door in half, moving the knob to the bottom half, adding extra hinges to the top half, and then installing a latch to hold the doors together when closed.